Simple and foolproof to book Time and Disbursements including Pre and Post-Appointment Time and Non-Chargeable time. Multi User System – All Staff can book time, produce Management Reports and use other functions at the same time. 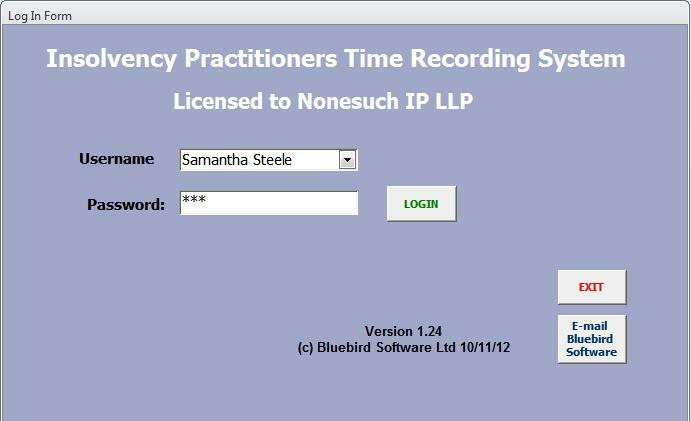 New feature for 2013 allows staff to book time on an Excel Spreadsheet which can be automatically input into the system. Offloading of old cases to a backup database. Reports showing Work In Progress, Time Booking Breakdown by Client or for all Clients. Currently in daily use at several Insolvency Practitioners around the country, the system allows administrative tasks connected with billing to be reduced to a minimum whilst providing the full statutory reporting to Clients. Half a Day’s training (Additional training can be provided if required).